Chinese New Year is here. Every part of the city is once again basked in a Chinese deco, the background Chinese music keeps the spirit up, and shops and restaurants are busy promoting special offers. All promise that the year of pig is going to be a prosperous one. This is a time when food occupies a center part of people’s mind. What to eat and what good fortune one is going to have are issues dealt by many. 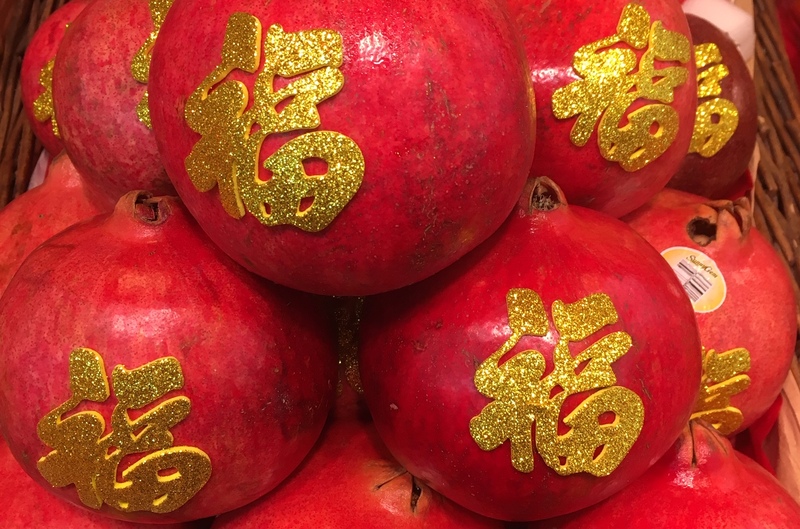 It is quite a common knowledge, possibly worldwide, that at Chinese New Year food is highly correlated with auspicious meanings. Fish signifies surplus. Chicken is for good luck, and rice cake represents progress year on year. And those finger licking sugar coated lotus roots carry a meaning of plenitude. Knowing which food carries what fortune is a partial understanding of food culture at Chinese New Year. What food really does is to bring people together, to reproduce an harmonious political and social environment, a belief deeply ingrained in Chinese mainstream culture and tradition. This is the reason that food is often exchanged as presents to express gratitude and thanks. Moreover, the process of food making can be a mini version of social production. As a Mandarin teacher, dumplings came to me immediately as a good example. As a way of introducing Chinese culture, and literally let students have a taste of it, for many years, Chinese teachers around the world have been organising students to make dumplings during Chinese New Year. Making dumplings from scratch is hard work. Students need to first of all sort out the division of the labour, who shops for vegetables and meat, who rolls dough, who mixes the fillings, and who wrap up dumplings. Someone has to watch over the stove and make sure there won’t be any disasters. There will be different preferences and conflicts. Students must work out the issues constructively. And after all is done, they can enjoy the fruit of their labour, and exchange ideas and commentaries merrily. This activity in its essence is a community building exercise. It makes sure that everyone is included and is making contribution to the whole. This is a different aspect on how food connects people and reproduces a united society, materialising community-orientated relations. Eating food is also a way of showing respect and appreciation. Hence, we see employees, friends and neighbours are invited to eat. People invite the elders to eat first, and during the meal they put food into other’s bowl to show care. All the dishes are laid at the table, and diners can pick the one they like. This is an idealised society with order, self-restrains and goodwill, while individuals are also provided with certain freedom. Without understanding this food culture, things can go terribly wrong. One example is the earlier controversy made by the Italian brand D&G, who released short videos featuring a Chinese woman eating Italian food with chopsticks. Many people resent these ads, criticising D&G being racist, stereotyping Chinese. The problem is not that D&G stereotyped Chinese. They didn’t. If they did, they would have featured a group of people with slanted-eyes sitting at table, eating, drinking and hailing “gan bei”. D&G’s mistake was that they inadvertently used elements of Chinese culture as mascaraed to trash Chinese culture. In Chinese, there is an expression “xiu se ke can” (秀色可餐), to describe that a woman is so beautiful that one can forget hunger. To translate it into a brutal term, it means “beauty can be served as food”. And it is what happened in D&G videos that a beautiful Chinese women was ruthlessly consumed. The videos resembled a celebratory occasion with a theme in red and gold. However, D&G failed to understand that food is supposed to bring people together in such an occasion. They made this women eat alone. They failed to understand that food is supposed to be accompanied with genuine social connections. They made her mute. She can only use gestures and facial expressions to respond, while being teased and criticised by a male-voice. She became the food to the eyes of the male spectator outside of the camera. She looks like a well-educated smart young woman, but the video makes her look stupid. The damage is threefold. She is pretty and yet she is stupid and powerless. This message runs against the current social and political environment where women are fighting for an equal society. And she is a Chinese woman. This did not sit well with a nation who has had decades of huge economic growth. Lastly and the most severe is that, chopsticks, proud by millions of Chinese, became a tool to engineer inferiority that Chinese chopsticks are no match against Italian food. The founders later apologised in Chinese. Perhaps they need to take more lessons. Let’s get back to Chinese New Year, and remind ourselves that family, friends and communities are at the center of the celebrations. While we enjoy great food, some good fortune might be there waiting for us around the corner.